Chris Roberts. Sitting in a starfighter, naturally. In the late 80s, Chris Roberts joined the company Origin Systems and produced a couple of games for them before releasing the game he's most famous for, Wing Commander, in 1990. 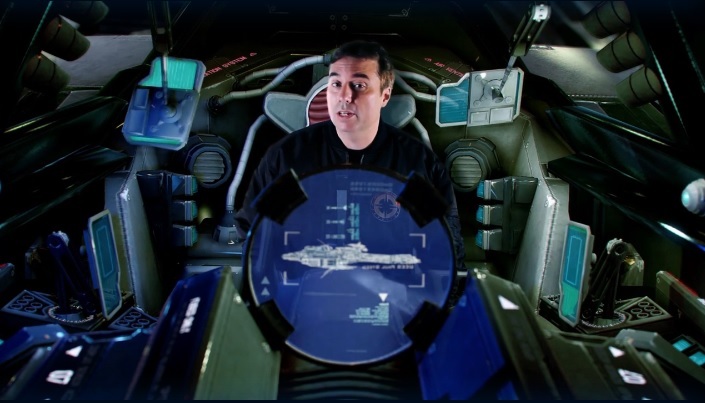 Afterwards, Roberts worked on the flight sim Strike Commander which retained the same mechanic of cutscenes and character interaction that made the Wing Commander games so great. This time though, you were also able to manage a company of mercenaries which added that extra challenge in that you had to be efficient. Wasted too many bombs and missiles and you were soon broke. Roberts would also design the original concept for Wing Commander: Privateer which his brother, Erin, produced. Roberts left Origin in 1996 and formed his own studio called Digital Anvil. At Digital Anvil, he developed games which would basically become spiritual successors to both Wing Commander and Privateer, i.e. Starlancer and Freelancer respectively. Freelancer turned out a huge success and dedicated fans still have servers running this game to this day. Roberts didn't stay long at Digital Anvil and spent most of the 2000s making movies, serving as producer on movies like The Punisher, The Jacket and Lord of War. Roberts did eventually return to the PC gaming industry though and launched a crowdfunding campaign in 2012 for an ambitious new game called Star Citizen. Part of his pitch video encouraged viewers to prove that space simulations on the PC weren't dead. The game has so far raised over $17 million which is an amazing feat for a crowdfunded game. Roberts has always managed to live up to Origin's old motto which was "we create worlds". Not only were the space sims he created fun in their own right, but the characters, the struggles, the destinations you visited felt real. When I think of space sim designers, there are only a handful I can think of (the only other two being David Braben and Lawrence Holland), but Chris Roberts has definitely left the biggest impression on me out of all three of them and this is why he deserves his place at #3 on my list of Top 10 PC Game Developers. Up next at #2, the master of turn-based strategy games.